Posted by Shelley Grell on May 7th, 2012. After the Feburary 2011 earthquake Communicate IT started a virtual operation with Shelley and Shannon working from their home offices and making use of online tools such as Dropbox and Skype. The Avonside office was badly damaged and out of action for many months while it was undergoing emergency repair. Now on TC3 land, it is anyone’s guess when the 100 year old converted villa-office (owned by Shelley and her husband) will be fully repaired back to pre-earthquake state. Meanwhile Shelley is operating from her North Canterbury home and regularly commutes to Christchurch to visit our customers or to work from the Westpac Business & Community Hub in Addington. 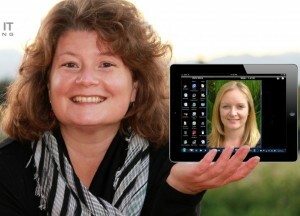 She is still on the committee of the Canterbury Software cluster and attends most of the ICT events in Christchurch. Our contact details remain the same, and if you are not using Skype yet, try it and let’s get connected!